Charles Darwin’s voyage on the Beagle is at once a gripping adventure story and a turning point in the making of the modern world. Read in sequence, the letters are a first-hand account of a voyage of discovery that is as much personal as intellectual. It was a letter, received unexpectedly in the summer of 1831, which led the somewhat aimless and ordinary twenty-two-year-old graduate to undertake the trip that would lead to his conviction that species had evolved. Darwin’s father initially forbade him to go on the voyage, worried that his son would fail to settle into a career, but he relented and we see Darwin prepare for his travels, land on his first tropical island, watch an earthquake level a city, and learn how to catch ostriches from a running horse. We witness slavery, political revolution, and epidemic disease, and share the otherworldly experience of landing on the Galapagos Islands and collecting specimens. Darwin’s letters are counterpoised by replies from family and friends that record a comfortable, intimate world with echoes of Jane Austen and George Eliot. The story ends with Darwin’s return to England, the delighted reactions of his family and friends, and his almost immediate immersion in London scientific society. This volume contains the complete texts of all the letters that the young naturalist Charles Darwin wrote and received while sailing round the world on the surveying ship the Beaglebetween 1831 and 1836. They start with letters written as a new and aimless graduate of Cambridge University before the offer of a place on the voyage had reached him, and go on to give a vivid first-hand account of his exciting and scientifically significant travels to South America, the Galapagos, and Australia. 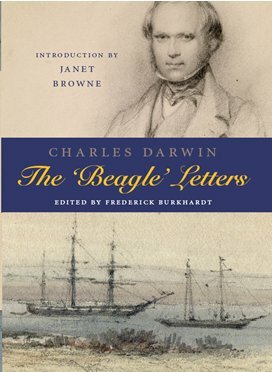 The complete texts of all letters from the voyage are brought together and arranged chronologically with a substantial introduction by the leading Darwin biographer, Janet Browne, and with a series of beautiful watercolour illustrations from the sketchbook of Darwin’s Beagle companion, the artist Conrad Martens. The footnoting of the letters is light and offers precisely what is needed to explain occasional difficulties in the letters for a non-academic audience. The letters were originally published in volume 1 of The correspondence of Charles Darwin, Burkhardt et al. eds. CUP 1985.